Located in the beautiful north western region of Spain, Lugo is the capital city of the province of the same name. While there are many fantastic things about the city itself, the UNESCO World Heritage Site have recognised its surroundings as being worthy of a place on the list. The Roman Walls of Lugo were built to fortify the town, and are fantastic examples of defences from that era. The Walls are widely regarded as the greatest remaining specimens of their kind in the whole of Western Europe, with plenty of great B&B and Hostels near by. The walls surround the historic centre of the city in its entirety, the likes of which cannot be found anywhere else on Earth. These seemingly impenetrable fortifications span over an incredible 2 kilometres around the historic centre, and stand between 8 and 12 metres high! If you’re thinking of making a trip to see them first-hand, you can now enjoy looking down from the walls, as well as looking up at them. Visitors can experience the magnificent walls from a walkway which is open to tourists who can enjoy a stroll around the whole length! The town itself also has a dedicated visitor’s centre for its famous fortifications, called Centro de Interpretación de la Muralla. An impressive total of 10 gates still provide access to the centre, two of which are especially well preserved. Porta Falsa and the Porta Mina are the most grand of the entrances to the historic city centre, with Porta Mina maintaining its original arch between two towers in the wall. Amazingly, 49 of the towers are still intact, and a further 39 have partially remained. Construction of the city walls were begun in 263 A.D. against tribesman from the local land, and also from Germanic invaders! The majority of the building was completed in 276 A.D, and were only a part of the fortifications that the Romans used to defend Lugo. They also quickly began work to erect a moat, and an intervallum – a clearing between the walls and the city – for the troops to defend. The Roman Empire was a force to be reckoned with for good reason; they certainly knew how to protect their land. The walls are an incredible 4.2 metres wide and it would seem that even the artillery of the time would have struggled to penetrate the defences. Over the course of its history, many pilgrims came and went through the gates of Lugo’s walls. During the Middle Ages especially, a huge number of people passed through Porta Mina, in the hope to reach Santiago de Compostela. During the 9th century it was a highly valued pilgrimage route for Roman Catholics, for its destination had origins in the shrine of St. James the Great. If the city was so heavily defended, it is definitely worth looking inside to see what was so valuable, and in need of protection. The historic centre of Lugo is home to some incredible architecture spanning a history of over 2,000 years. Influences from many different cultures can be seen in the stonework, housing and decorations throughout the city. 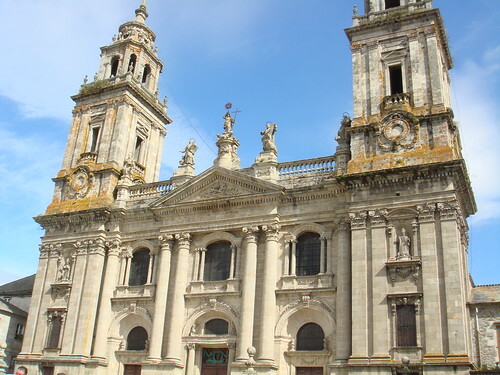 Visitors should pay a visit in particular to Lugo’s Cathedral, shown in the picture, for its splendid grandeur and cultural value. The Roman Walls, and the city they guard, have a wonderful wealth to offer their visitors. Thousands of tourists from all over the globe come to visit the site every year, and take away with them the amazing sights, sounds and memories. 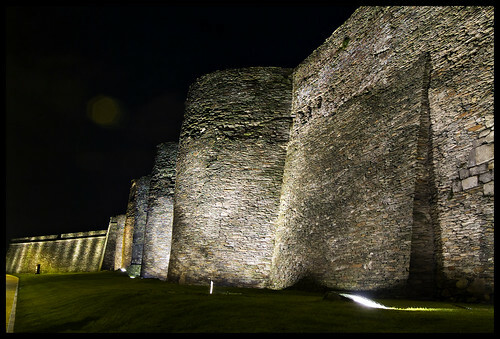 Why not begin your own pilgrimage to the Roman Walls of the Lugo and beyond?